Thanks for dropping into the Mollsmyre Photo Galleries. I enjoy Photographing and filming at Heritage Railways and Classic Bus Events, Amongst other things. I hope you will find something of interest in my site. 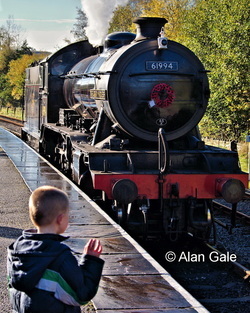 I don't profess to be an expert on Bus or Rail matters and that is why the site is presented as a Photo Gallery format. I wont make a fool of myself by inserting information other than locations etc. 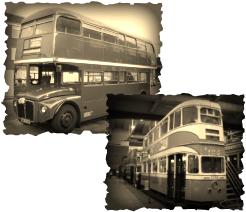 The strange thing is I have worked on 'The Railway' and a few bus companies in my time and to be perfectly honest I had little or no interest in buses or trains at the time. I saw them purely as a way to earn a living. I never gave taking photo's a thought. Now most of the bus companies that employed me have disappeared, and The Railway having changed so much What an opportunity missed. I could kick myself. Thanks to Alan Gale for the use of this Photo. I bet, like me you have been asked on numerous occasions Why do you like Steam? Why do you like Railways? . As you try to explain you can see the vacant look on their face and you know they have dismissed you as an nutter,an anorak or whatever the term is nowadays. They don't have a passion for steam, so they cant appreciate the workmanship that is a Steam Locomotive, Add to that the memories of a railway in its heyday, What's not to love. When I saw this photograph by Alan Gale of Windypics fame It looks like the passion of steam may be passing on to yet another generation. Lets hope so.